Rising seas burying houses doesn’t sound great, but what if your house is underwater already Take that, nature! Let’s take a look at the 10 most amazing underwater buildings that actually exist. Be Amazed at these top 10 Most Amazing Underwater Buildings That Actually Exist! Jules Undersea Lodge - The Jules Undersea Lodge began life asLa Chalupa Research Lab, a facility for the study of marine life located off the coast of Puerto Rica. The Conshelf - Jacques Cousteau, the famous explorer, loved being underwater. Cousteau loved being underwater so much you suspect he’d have lived there if he could – hence, the Conshelf. Floating Homes - Floating homes may not be an entirely original idea – what’s a boat, after all –but the Floating Seahorse luxury villas in Dubai take things to a whole new level. Undersea Restaurants - Seafood lovers will be like kids in a sweetshop if they get the chance to visit the ITHAA Undersea Restaurant. Utter Inn - Scandanavians are generous souls. The Hydrolab - The National Oceanographic and Atmospheric Administration’s Hydrolab research centre is an underwater structure worthy of its elongated name. The Aquarius - The Aquarius is something of a spiritual successor to the Hydrolab: an underwater research centre that is still plugging defiantlyaway beneath the waves. SEALAB - The SEALAB underwater facilities – there were three of them in all – were very much true to their name: they were labs under the sea. The Water Discus Hotel - The Water Discus Hotel looks set to blow all other underwater hotels out of the, um, water when plans are realised and it becomes one of the most striking buildings in Dubai. 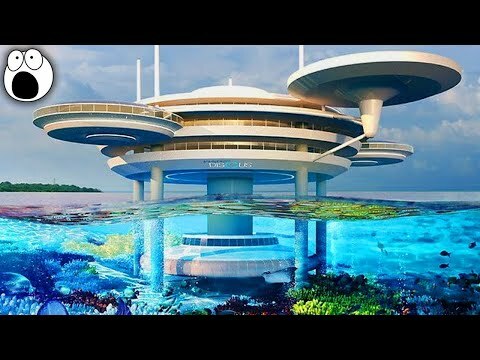 US Submarine Structures - The Water Discus Hotel faces hot competition from a planned 5-star luxury hotel at Poseidon Undersea Resort in Fiji.